If there was any ever doubt about how much tactics, and not just players, truly influence the outcome of a game, last night was a prime example. For the second time this season Birmingham manager Alex McLeish outwitted his opposite number and prevented Blackpool from playing their natural game. What is incredible is that it was all too predictable. So predictable in fact, that it is amazing that Ian Holloway didn’t do things differently. “I have to go away and look at why we lost 2-0, but well done to Alex. He is a smashing man. He got his tactics right and did me with his shape. “I haven’t seen them play the way they did with the diamond. I thought that was very clever because all the space that we normally utilise very well we couldn’t on this occasion because Alex’s formation killed us a little bit. So did he learn? Evidently not. Like the away game, Blackpool lined up with a formation that was almost 4-2-4, with Gary Taylor-Fletcher playing so far forward ‘Pool were overrun in midfield. 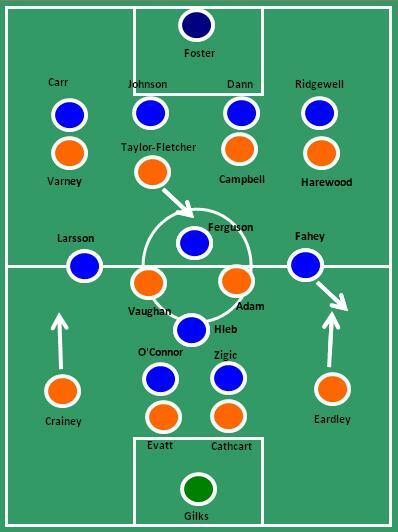 Tangerine Dreaming’s excellent blog on the away fixture could virtually be reproduced to explain why Blackpool failed to win the midfield battle, with the formation diagram still valid, albeit with a couple of names on the teamsheet slightly different. Holloway may defend his team selection by pointing out a lack of other options, and in his defence he’d possibly have a point. With Elliot Grandin injured and Ludovic Sylvestre’s match fitness in doubt, the only other out-and-out midfield option would have been Keith Southern. The former Everton trainee has yet to break into the side this season, initially due to injury. However, Holloway’s reluctance to select him when fit could intimate a worry about Southern’s ability to compete at this level – rumours of a January loan move might not be far off the mark after all. The clear stats show that Phillips had an off day. Almost half of his passes went astray during his 71 minutes on the pitch as he frequently gave the ball away, often leading to a quick Birmingham counter-attack. Phillips also found Liam Ridgewell to be a tricky opponent, winning only one of his seven challenges. These challenges are classified in the stats as ‘take-ons’, and it was evident how often Phillips appeared to be running straight into his man. At his young age it is not a concern, and he will certainly improve with experience, but this display shows that not much pressure should be placed on his shoulders, and we can’t always expect him to skip past his marker with the ease he showed in the last game out at Eastlands. A disappointing way to return to Bloomfield Road after 45 days without a home game, but it would be hard to claim the performance deserved anything more than a defeat, in spite of the improved second half showing. Aside from the aforementioned tactical issues, fatigue also seemed to play its part. ‘Pool have played fewer games during the last month than all of their rivals, but three games in a week looked to have taken its toll on certain players, and it was surprising that Holloway has made so few changes in this period after the Aston Villa situation in November. Those changes are sure to come in the FA Cup match at Southampton, with Holloway’s first choice side likely to rest ahead of the home game with Liverpool next Wednesday. Whether any new signings will take to the field against a possibly Hodgson-less Liverpool remains to be seen. However, with the subs bench against Birmingham not quite as inspiring as one would like, Holloway is likely to be desperate to recruit new players as soon as possible.